Isn't he just the cutest pig you have ever seen? 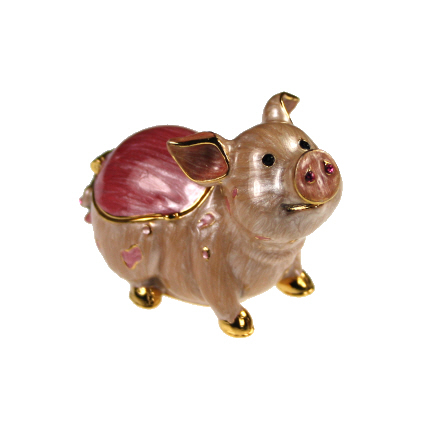 Our pig trinket box would melt the heart of any passerby. Pig enthusiasts all over the country are adding him to their collection. One of the 'Hidden Treasures' award winning range. Padded presentation box and replica necklace. A pair of porky Pig Cufflinks from our novelty cufflinks department.Our piggy cufflinks have curly tails and a smile on their faces! A navy blue pig tie with cute pink piggies in a repeat pattern on a pure silk tie. Great gift for farmers, small holders and pig lovers! A very cute large diamanté pig keyring with white stones and pink heart design on one side and gold coloured open filigree on the other.